In a horrifying dystopian future, women are stripped of their money, their job, their name, and their rights. Those who are unmarried, in second marriages, or in any kind of marriage the government disapprove of, are uprooted from their family homes and installed into the lives of those with status. Their role is to conceive a child for their appointed commander and his wife, due to the nations fertility problems. I fooled myself into thinking this would be the story of a strong feminist narrator who would overcome and perhaps overthrow the rules pressing down upon on her. It was much more melancholy than that; it was quiet, it was sad, it was a narrator who had accepted her fate, accepted her instruction, and lived each day in an apathetic haze. She tells her story with a subtlety which can only be described as frightening, flicking into memories of her previous life with a distant, yet resigned, longing. Making sense of the world Offred has found herself in was absolutely wonderful. Atwood writes with a confusing sense of unreality until more is given away slowly, and the mist begins to clear. We're left pretty much on our own to work out the details, and this trust in her reader is beautiful, making the realisation an unnerving prize; we've worked for it, but by this point, we're not sure we want it anymore. I was struck by Offred's memories of her past, and her commentary on how she didn't realise she was happy then. This is utterly frightening; does it take something like that to make us realise we were happy? Do we ever stop and think, this is beautiful; I'm so happy? Rarely, is my guess. One other moment of wonder for me was in Offred's flashback to the day she realised her bank account had been stopped, and her entire property transferred to her husband. She remembers how unmoved he was by this; he didn't understand her upset, he couldn't see how this was affecting her so badly. She thought, in some deep place, he actually liked the power. Think about that for a second. Those of us who cannot thrive on an open ending won't do well with the finale of this novel. But the ambiguity is the whole point. Should we see our protagonist with a happy ending? Or does that just suggest that even in the most oppressive and dictating society, there are such things as happy endings? We were guessing the fates of all of the characters here; why not one more? 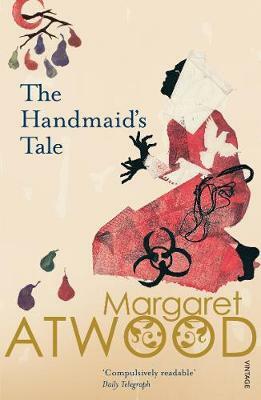 With this, Atwood has ensured we will never forget the handmaid. What terrified me most about this novel was that the government's horrific return to 'old values' was spurred on by an Islamic Fundamentalist attack. It was written in 1984. With all that's going on in our present day, it's not too difficult to imagine the implementation of new (or indeed old) doctrines which could, no doubt, entirely oppress a collective group. It makes you understand the women's attraction to the self-knotted rope. The scariest dystopian novels are the ones that aren't so unrealistic. This is a stifling and totally disturbing account of how our daily routine and comforts can be stripped away in a small space of time. That the regime we are used to is entirely controlled by our government; laws can be passed to change whatever security we hold dear, and if that happens, the most likely outcome will be that we keep silent in order to prevent the worst.